Sign up for Donuts Perks Here to receive a FREE Medium Beverage of your choice - also you will receive a FREE coupon on your Birthday for a FREE coffee, latte, tea, Coolatta or hot chocolate straight to your mailbox. 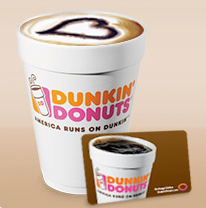 ● Your favorite drink–for free*–that’s your first perk. You’ll get a coupon for a free medium beverage in the mail by the end of next month. ● A birthday drink–it’s on the house. For your birthday, we’ll send you another coupon to enjoy a free* medium beverage of your choice. ● Email updates on the latest news, offers and DD events in your area. They left Colorado a few years ago so I can't get this. Thanks for the info.